Paul Hasluck edited the manual Bookbinding in 1903, and it was part of a series which included other titles such as Cycle Building, Taxidermy and Electric Bells: How to Make and Fit Them. As a bookbinding manual, it’s ok, though not nearly as good as others from this time written by Cockerell, Crane or Zaehnsdorf. 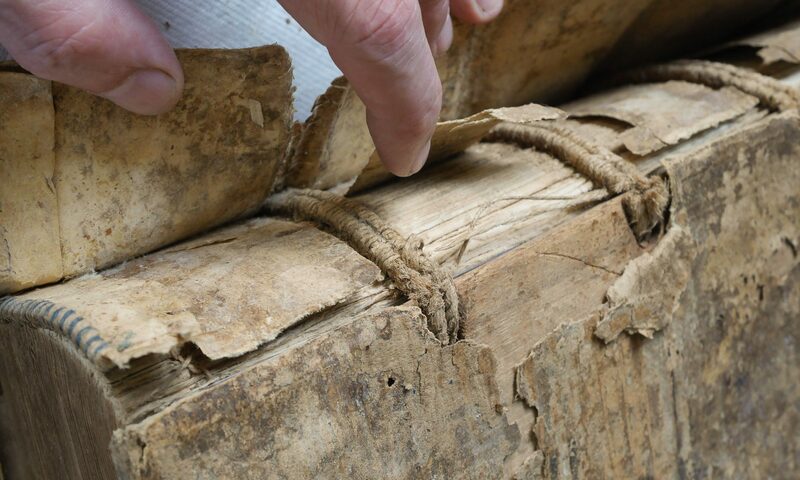 This time period is important in the history of bookbinding manuals, since many are specifically written for amateurs for the first time. Hasluck’s manual was reportedly written by an anonymous London binder and a Mr. Brown. One potentially useful aspect of this book are the many plans detailing how to make your own equipment. This book goes far beyond most bookbinding manuals in the complexity of DIY equipment projects. For example, it provides instructions for not only one, but three styles of a plough. Most of the woodworking information is pretty reasonable. There are a number of editions and various publishers of this book. All that I’ve seen share a distinctive, narrow format and very thin, semi-flexible boards. At least there is a 1903 Cassel and Co. edition, a 1907 Cassel (available on Internet Archive), a 1912 from David McKay, Philadelphia, and an undated one from Funk & Wagnalls Co., NY and London. The F&W edition has American style joints on the case and l’m guessing is from the 1920’s. The book is interesting in its early DIY ethos, and there is the corresponding commercialism of product placement and an interactive didactic aspect; readers are encouraged to write in with their questions. Fig. 1. Advertisement for “Gloophlex” on the front pastedown of Hasluck’s 1903 “Bookbinding”. Prominently featured on the front pastedown of the 1903 edition is a full page advertisment for Glooplex, a product I haven’t heard of before, or since. 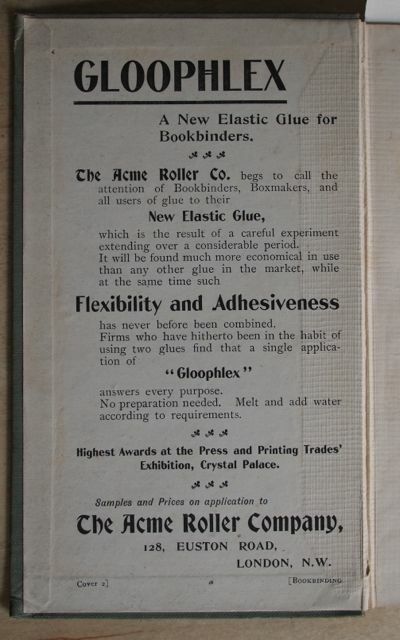 The text makes a point of mentioning that “Bookbinders use large quantities of glue in their work, and doubtless much time would be saved by employing some such preparation as ‘Glooplex’, an elastic glue, guaranteed by the makers to be strong and reliable.”  I’m guessing it is a hide glue with an additive, quite likely glycerine. Sometimes alum was also mentioned as an additive to make the glue more waterproof around this time, which unfortunatly results in a glue that is less easily reversible. It is quite uncommon to find specific products mentioned in early twentieth century manuals. Fig. 2. Cover of the 1903 edition. I assume the cover design is the same for the entire series. Joel Moskowitz, founder of Tools for Working Wood, is reprinting Work magazine in a cool manner; reissuing the original once a week, 123 years after the original publications dates. Originally each issue cost a penny, now they are free. They scans are quite large, so it is possible to read this magazine and examine the illustrations in detail. Work is a fun, varied read, and Joel mentioned he has about four years worth of material. In this era of shortened attention spans, I’m curious to see if Work resurrected will hold current readers interest. Fig. 3. Diagram of a copy press from ‘Work’. Courtesy Tools for Working Wood. 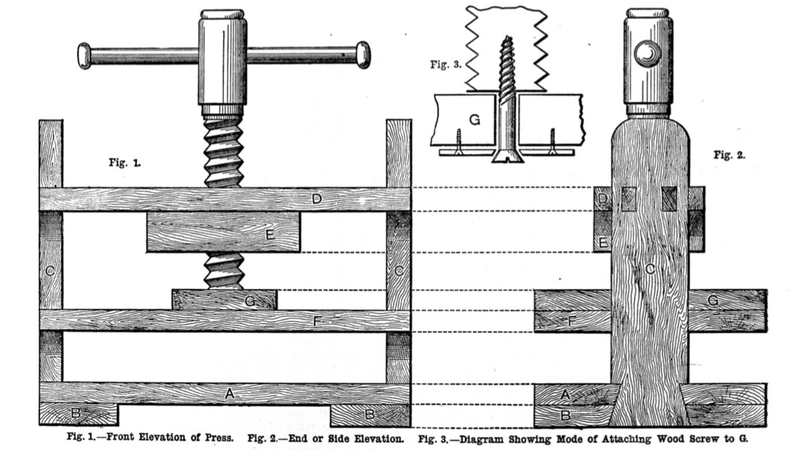 In particular, Bookbinders may find the article “How to Make a Wooden Copy Press” (Vol. 1, No. 2) useful. I haven’t tried to make it, but the instructions seem to be adequate for making a light duty press, quite similar to entry level presses still sold today. I might be tempted to double the thickness of the wood on the platens, depending on the final size, and a metal screw would add a lot more force. David Denning, author of this article and a woodworker, wrote four books on woodworking including in 1891 The Art and Craft of Cabinet-Making, available in facimile from Toolemera. Denning manages to avoid the most difficult aspect of this project, making the screw, mentioning he found one in the trash— a man after my own heart. If you are not so lucky, it shouldn’t be too difficult to modify one from a woodworking vice, make your own from commercially available acme threaded rod and handles, or if you are feeling adventurous learning how to cut a wooden thread using taps and dies or a router jig. In my early years, I even made a crude standing press out of a scaffolding leveling jack that I had found. I placed the nut under a frame made of 2 x 4’s to tighten. Crude and awkward to use, but it generated a ton of pressure. Fig. 4. 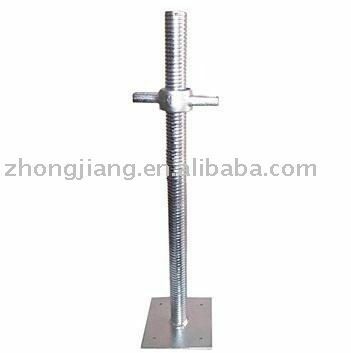 A scaffolding leveling jack. Work covers a wide range of crafts, not just woodworking. Perhaps a testimonial in the back of the Hasluck’s Bookbinding for Work magazine is reason enough to dwelve into this journal. “I owe to WORK a house for my family, a tranquil night’s rest, and an education for my children.”  What’s to loose? 1. Paul N. Hasluck,ed. Bookbinding (London: Cassell and Co., Ltd., 1903), Preface. 3. Paul N. Hasluck, ed. 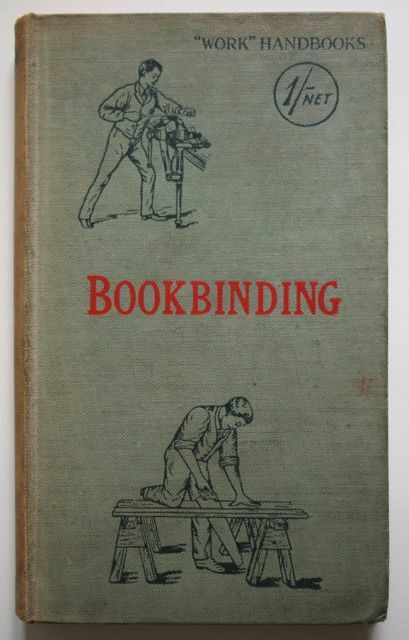 Bookbinding (New York and London: Funk and Wagnalls Co., [nd]), Publishers’ Note. 4. Hasluck, Bookbinding,1903, page opp. 160. 5. Hasluck, Bookbinding,1903, page opp. 160.